A ridiculously versatile mono/ paraphonic synth. Without doubt a great investment. Crammed full of indispensable features but still remains intuitive. Sequencer and deep CV functionality are hugely welcome additions. The new superwaves and Prophet 5/SEM filters give it a truly unique sound. The P2 is mono-timbral, so there's no layering, stacking or splitting like the P12. The last DSI product this writer had the pleasure of reviewing was the Mopho SE and, as much as we dug it, we couldn't help feeling that the Mopho engine was getting a little long in the tooth. 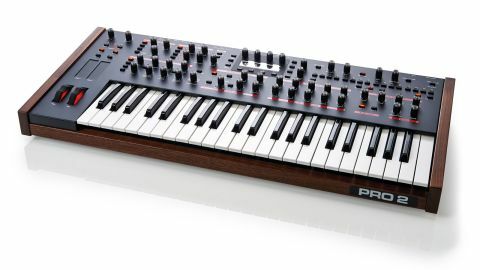 Thankfully, it seems DSI have been listening to our prayers and low and behold, we now have a brand new DSI monosynth before us, in the form of the Pro 2. "The sturdy metal case and copious amounts of wood make you feel like you have invested your money wisely"
Essentially, it's a reimagining of the classic Dave Smith designed Sequential Pro 1, yet it shares much more in common with the Prophet 12 than with the Pro 1 or the Mopho range. In its most basic form, the Pro 2 is based on a single Prophet 12 voice, however some great additions/ improvements have been made to the sound engine especially for the Pro 2. The P2 feels every bit as high-quality as the P12 and the sturdy metal case and copious amounts of wood make you feel like you have invested your money wisely. The overall feel is tough and utilitarian and, while it will happily sit in any studio, it's definitely built to stand up to the rigours of touring. All the switchgear is the same type/quality as found on the P12 and the rubberised knobs/plastic buttons feel sturdy. The 44-note keybed features velocity and aftertouch (rejoice!) and it's very pleasurable to play with a nice weight and balance, yet it's precise and fast at the same time. Again, like the P12, the P2 features lovely red backlit pitch and mod wheels and there are also two assignable touch sliders (also found on the P12 and Tempest) that really open up live tweaking. The general layout is very intuitive and the OLED screen (again like the P12 and Tempest) is a joy to use - it's easy on the eyes and readable in all lights and from all angles and it never gets cluttered. Also, the cleverly designed OS means that you hardly ever need to look at the screen (unless you want to) and all the key functionality has a direct control on the front panel, letting you tweak away without having to get lost in menus. "Make no mistake - the P2 is simply one of the most powerful monosynths this writer has ever laid hands on!" We also prefer the location of the delay effects section on the P2 compared to the P12, as now you can play a line or chord with your right hand whilst tweaking the delays with your left. It's hard to ignore the impressive amount of connectivity round the back. There's USB for bi-directional MIDI and communicating with DAWs, MIDI In and Out (plus a handy second MIDI Out that doubles as a Thru), foot switch and pedal jacks, four CV inputs and four CV outputs for interfacing with other CV equipped gear (the modular heads will love this! ), a gate output for triggering other gate equipped gear, plus an audio input with envelope follower (you can process external audio here or use external instruments/drum machines to trigger the envelopes and sequencer) and Left/Right/Headphone outs. Now let's get straight into the sound engine. The P2 feels much like the P12 in use and the OS works in a very similar way (though of course this is a monosynth with paraphonic capabilities, not a 12-voice poly). Particularly worthy of note here, however, is that in paraphonic mode, each of the four oscillators has its own envelope, which makes it much more playable as a convincing polysynth compared to other paraphonic synths, especially as the note decays sound much more natural. Notably, there are very few missing features on the P2 compared to the P12 but an important point to consider when weighing up the P2 vs the P12's sound engine is that the P2 is mono-timbral, so there's no layering, stacking or splitting like the P12. At its heart the P2 has four oscillators running through two new filters (inspired by the classic Prophet 5 and Oberheim SEM designs) but, whilst the filters are analogue, the oscillators are firmly digital. There are four classic wave types, 12 complex wave types, a sine sub oscillator, three types of noise and, uniquely to the P2, 13 new 'superwaves' per oscillator with up to three waves available simultaneously (as on the P12). The superwaves obviously pay homage to Roland's Super waves and the concept is the same - several waves stacked up to form one huge detuned wave, perfect for making trance sounds and huge detuned patches. Like the P12 you can use shape modulation/ variable pulse width to alter the wave shapes and transition seamlessly between the three waves and this is superb for creating moving soundscapes and continuously evolving sounds. Examining the raw oscillator waves more closely, whilst they don't sound as big or as rich as VCOs/DCOs, the P2 has its own unique character and the scope of sounds available from these digital oscillator waves is far greater than from most VCO/DCO monos. Make no mistake - the P2 is simply one of the most powerful monosynths this writer has ever laid hands on! Whilst the presets on offer aren't bad, they largely cater towards sequences, arps and showing off the vast modulation capabilities (with a few nice paraphonic patches interspersed) and they don't really show off how great this machine really is. So, we set about creating some classic analogue-style pads, strings, leads and basses (which is always our acid test for any synth). The results were generally great, especially in terms of pads, comping sounds and leads and this is largely due to the present upper mid range, though getting tight, warm and thick, yet gooey analogue-type basses takes a bit more work as the low mids are a little subdued (much like the P12). "In many ways the P2 surpasses the P12 and it costs £700 less"
However, with a little tuned feedback, 'Girth' and adding in a sub oscillator, you can certainly get in the vicinity of classic analogue bass tones. In addition, the new filter set-up is very versatile and, combined with a little oscillator slop, detuning and adding in some character effects and distortion, there are many different personalities that this synth can offer. Though, as versatile as the DSP oscillators are, we'd still love to hear a VCO driven DSI synth someday. Here's hoping! The P2 has all the features you could want in a monosynth, yet it's easy to get to grips with and sounds unique. The new filters sound great, adding welcome relief from the brassy Curtis designs used in DSI's other synths and the superwaves greatly expand the sound palette, even beyond the flagship P12. Sound designers for film and TV will love it and its chameleon-like character enables it to straddle many genres effortlessly including D 'n' B, Funk, Dubstep, Ambient and atmospheric styles and it certainly has the power to rip off heads and rumble stomachs too! The Paraphonic feature is an indispensable bonus addition and the P2 can make some surprisingly solid poly-type sounds too including string ensembles, pads and brass patches. Add in the powerful sequencer with parameter type locking, the arpeggiator, the new BBD delay, character effects and extensive CV specs and it's pretty hard to beat.